Some typical values of the corresponding shear stress capacities (rRd.c = Vri,c/bvd) arc given in chapter 8 (table 8.2). Assumed truss model for t variable strut Inclination method compression member and as the diagonal compression members inclined at an angle 0 to the horizontal. The bottom chord is the horizontal tension steel and the vertical links are the transverse tension members. It should be noted that in this model of shear behaviour all shear will be resisted by the provision of links with no direct contribution from the shear capacity of the concrete itself. The angle 0 increases with the magnitude of the maximum shear force on the beam and hence the compressive forces in the diagonal concrete members. It is set by EC2 to have a value between 22 and 45 degrees. For most cases of predominately uniformly distributed loading the angle 0 will be 22 degrees but for heavy and concentrated loads it can be higher in order to resist crushing of the concrete diagonal members. 3. Calculation of the additional tension steel /\s| required in the bottom chord member. The shear force applied to the section must be limited so that excessive compressive stresses do not occur in the diagonal compressive struts, leading to compressive failure of the concrete. Thus the maximum design shear force Vrj max is limited by the ultimate crushing strength of the diagonal concrete member in the analogous truss and its vertical component. With reference to figure 5.2, the effective cross sectional area of concrete acting as the diagonal strut is taken as bv x jcosW and the design concrete stress/al -/ck/l.5. As previously noted EC2 limits 0 to a value between 22 and 45 degrees. If mux(22> < Vu lhen a larger value of the angle 0 must be used so that the diagonal concrete strut has a larger vertical component to balance VEd. which is the upper limit on the compressive strength of the concrete diagonal member in the analogous truss. When V|. 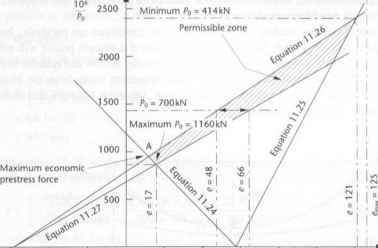 ;r > VRd.max(45)> from equation 5.7 the diagonal strut will be over stressed and the beam's dimensions must be increased or a higher class of concrete be used.